Tilda drew this at kinder this morning - it's much more representative than her usual kinder artwork. I was very impressed by the campfire! After her swimming lesson today, Tilda really wanted to go off the diving board. I wasn't sure how good an idea it was, but I let her try anyway. Perhaps fortunately, she chickened out when it came to walking all the way to the end of the board. Instead she jumped off the edge of the pool in the deep end, and then jumped off a diving block. Her swimming teacher might get the class jumping off the diving board next week. The postcard from the council about overhanging branches may or may not have been aimed at me specifically. Regardless, I went a bit nuts with the hedge trimmer today. I managed to avoid cutting through the extension cord this time! Yesterday Tilda came home from kinder and had a nap - for about 6 hours. I caught up on a lot of tv! Today, Tilda felt fine, so we went to Jessica's birthday party. At dinner tonight, Tilda threw up on the table. I didn't have my camera handy. This was my unnecessary purchase of the day - a $31 water bottle for Tilda. But it won't leak! And it's so pretty. Tilda and I had a few clashes today when I was trying to rush her through getting showered and ready. Later on she said "When I was watching Bambi, Thumper said if you can't say anything nice, don't say anything at all. Maybe we should try that?" I'm pretty sure she meant "Maybe you should try that." Perhaps as a result, her selective hearing is quite acute today. I've said several things 4 times to absolutely no reaction. I've starting cupping my hands around my mouth for a megaphone effect. Tilda slept over at Elena's last night, as I had a rehearsal. 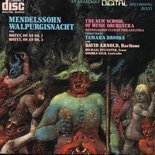 We were rehearsing Walpurgisnacht by Mendelssohn. How can you not like a piece that merits an album cover like this? I met up with them today at the Book Shop Cafe in Camberwell. Tilda and I then moved on to IKEA and she ate in the cafe there too. George got lonely while we were out, I guess. Tilda got another surprise from Grandma in the mail today - Dora the Explorer pyjamas! They have eclipsed even the announcement that she'll be going to see Hi-5 in November. And today she said "What is salad?" It was another nice day yesterday, so we went to Ruffey Lake and George got to frolic. Tilda was dragged along to my singing lesson today, so as compensation we dropped by the zoo, which was close by. We didn't get to see very much before it started raining (you can see raindrops in this picture) so we saw butterflies and an elephant, ate lunch under cover, and went home. As I was writing this, Tilda and I were disagreeing as to whether she should be in bed, having previously made a bonus 3-story deal if she got into bed before 9:30, which she reneged upon once the stories were read. I decided to ignore her, and fortunately she decided to lie down on the nearest soft surface - George's bed. I'm not sure, but I think George is still up in Tilda's bed. I don't know what we're going to do when we run out of new shirts. Do laundry, I guess. It was a lovely day today, sunny and 16. (I think of all Melbourne winter days as being like that, so every winter I'm sorely disappointed.) We went to the Collingwood Children's Farm with Elena and Maurice. Tilda's favourite part was holding the Patchy the guinea pig. On the way home we stopped at the mall in Doncaster, and I had to take a picture from the scenic parking lot. I now know that Tilda is 105 cm tall, thanks to the IKEA Kids Club height chart that came in the mail today. I've taken the smudgy height marks off the fridge. We had our typical slow start to the day, but obviously Tilda still needed a fairy skirt. Then she put on another one of the new tops, and created something with Duplo that I had to come see. George had to come see too. George was quite full of beans today because he didn't get a walk yesterday. I was reminded of why he should get a walk every day when we went to Ruffey Lake Park and he was slightly, um, inattentive to me. Very attentive to a guy on a skateboard, though. Tilda got flowers yesterday too - jonquils, which are so smelly that they were banished to her room. I got a New! Tape! Dispenser! today, which is much much easier to use than the cheap roll of tape I bought last, and so Tilda is finally able to access the sticky tape. 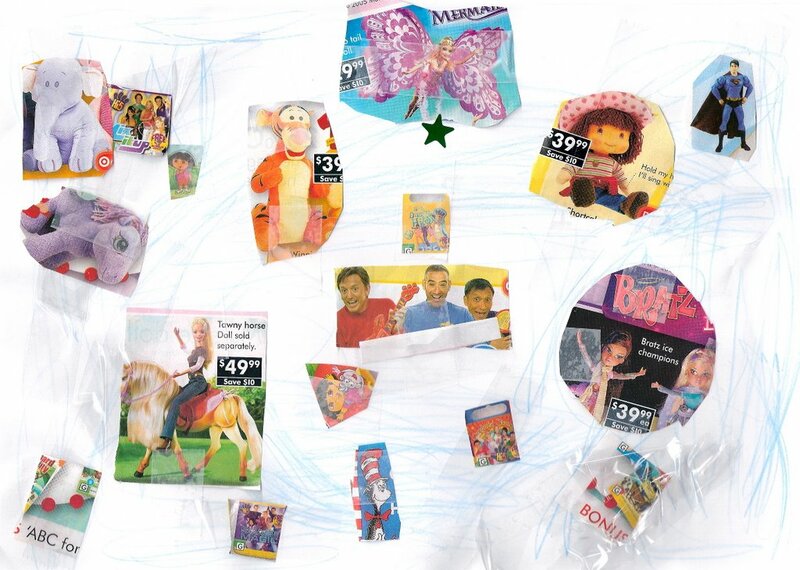 She went nuts with bits of a KMart catalogue. Tilda and I have both been sick lately. She went to the doctor on Friday and got eye drops for conjunctivitis, and amoxycillin for a throat infection. The eye drops were quite a battle, but fortunately she only had to have them (3 times a day!) for 4 days. The amoxycillin went down much easier. Today we went to the Book Shop Cafe in Camberwell, to have coffee/babycino and our favourite chicken and avocado focaccia. Before we went Tilda was quite proud of her ability to eat even large chunks of avocado, but apparently that was merely theoretical, as she picked the avocado out. Here she is wearing one of the many new tops that have arrived in the mail, courtesy of Grandma. And I got some native flowers from the market.